With a glam style befitting of a hollywood star, this six drawer dresser provides a unique combination of high fashion and valuable bedroom storage. 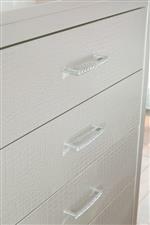 Six crocodile pattern embossed drawer fronts are accented by faux crystal drawer pulls. When opened the drawers show off a clean look and offer snag-free storage thanks to paper wrapped drawers. Combine all of that with a flashy metallic silver finish and you'll feel the need to roll out the red carpet every time you put away clothes. The Olivet Glam Dresser with Faux Crystal Drawer Pulls by Signature Design by Ashley at Wilson's Furniture in the Bellingham, Ferndale, Lynden, and Birch Bay/Blaine, Washington area. Product availability may vary. Contact us for the most current availability on this product. Finish Metallic silver finish and embossed textural panels. 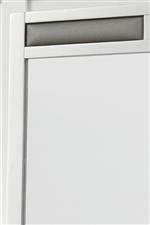 Handles & Hardware Drawer pulls showcase an inset faux crystal for a glamorous look. Drawer / Shelf Construction Paper wrapped drawers prevent snags and offer a sharp look. Drawer Suspension Center mounted metal glide drawers. Case Construction Wood solids, veneers, and embossed textural panels. From the flashy beds to the glamorous storage pieces of this collection, each piece shows off a glam style worthy of a Hollywood star. 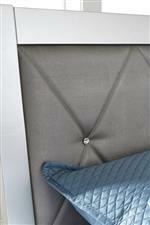 Beds show off gorgeous faux jewel button tufting to complement the faux crystal drawer pulls of storage pieces while a faux-leather upholstery offers a complement to the collections metallic silver finish. Embossed crocodile pattern panels take the glamour to the next level while crisp vertical and horizontal lines embody contemporary design. The Olivet collection is a great option if you are looking for Glam Contemporary furniture in the Bellingham, Ferndale, Lynden, and Birch Bay/Blaine, Washington area. Browse other items in the Olivet collection from Wilson's Furniture in the Bellingham, Ferndale, Lynden, and Birch Bay/Blaine, Washington area.